Teaser image for Jurassic Park 5, via Colin Trevorrow/Universal. Well, this is a doozy. Jurassic World director Colin Trevorrow tweeted the above image this afternoon, which is a teaser for the upcoming “Jurassic World 2” (Jurassic Park 5?). The film doesn’t have an official title yet, but apparently they started shooting on February 23rd and are aiming for a June 2018 release. The Victorian-style museum gallery piqued my interest immediately. 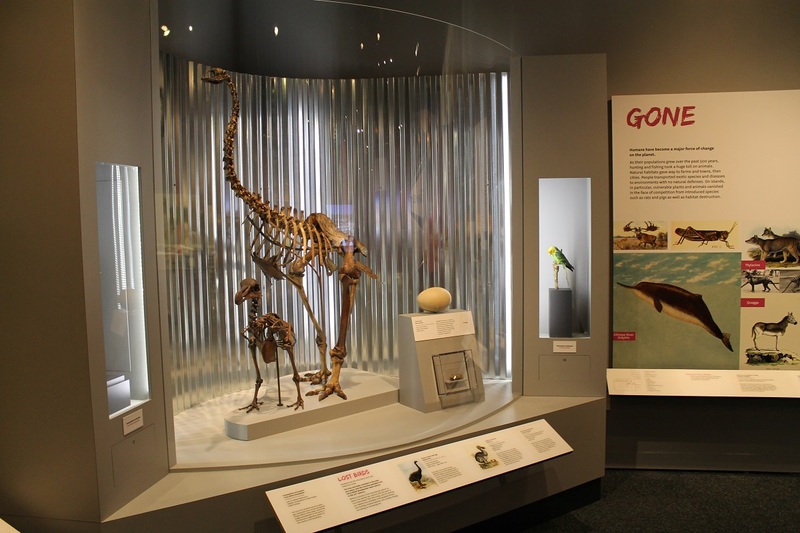 Since this is the first promotional image they put out, it stands to reason that natural history exhibits might play a significant role in the film. Is this a flashback to a formative experience for a main character? Or is it a brief moment of quiet before Chris Pratt smashes through the wall riding a mutant cyborg T. rex? Both are probably equally likely at this point, but there are still a few things worth noting. First, this scene is plainly referencing the century-old association in the public consciousness between museums and dinosaurs. 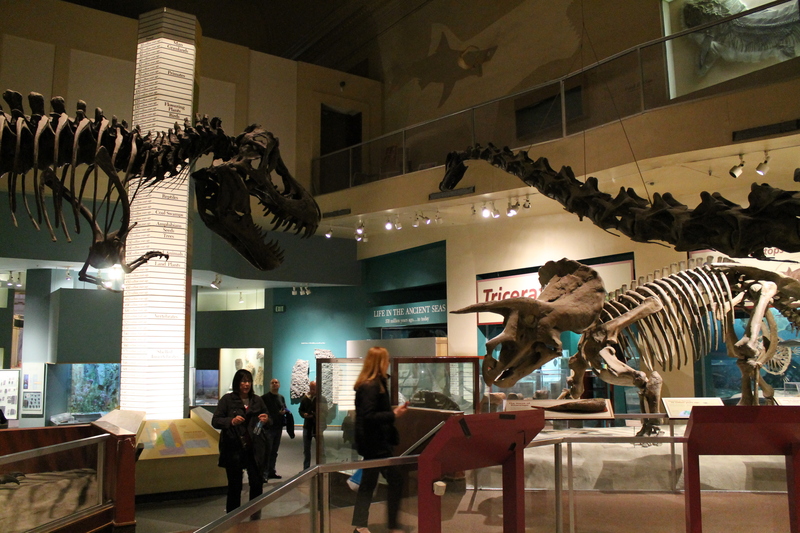 When we think of museums, we think of dinosaurs, and vice versa. 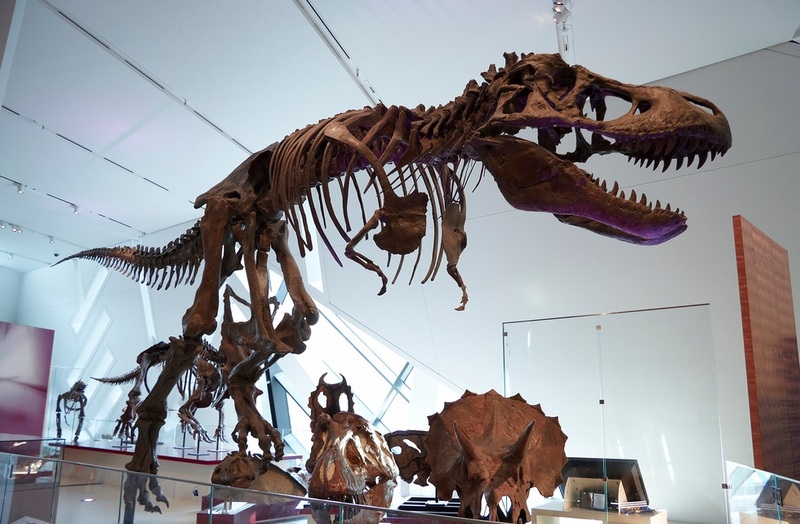 This is no accident – as I’ve discussed here on many occasions, dinosaurs (and their mounted skeletons in particular) played a central role in defining the modern museum at the start of the 20th century. The first Jurassic Park film played with this iconography in its classic finale, when the flesh-and-blood Tyrannosaurus and Velociraptor literally obliterate a pair of skeletal mounts. In that case, the implication was clear: the living, cloned dinosaurs represent new technology and scientific progress smashing the old and obsolete incarnations of paleontology to bits. Is “Jurassic World 2” pushing a similar message, casting the iconography of a museum hall as a past doomed to extinction? Maybe. The Victorian design elements – wood paneled walls, skeletons on open pedestals in orderly rows – distinctly evoke museums of the past. You’d be hard pressed to find an exhibit that looks like that today. Perhaps the filmmakers are using the Victorian iconography to enhance the impression of dusty obsolescence. Or maybe the baby boomer producers are recreating the sort of museum they remember from their childhood. The primary counterpoint is that the mise en scène on display here is stately and impressive. 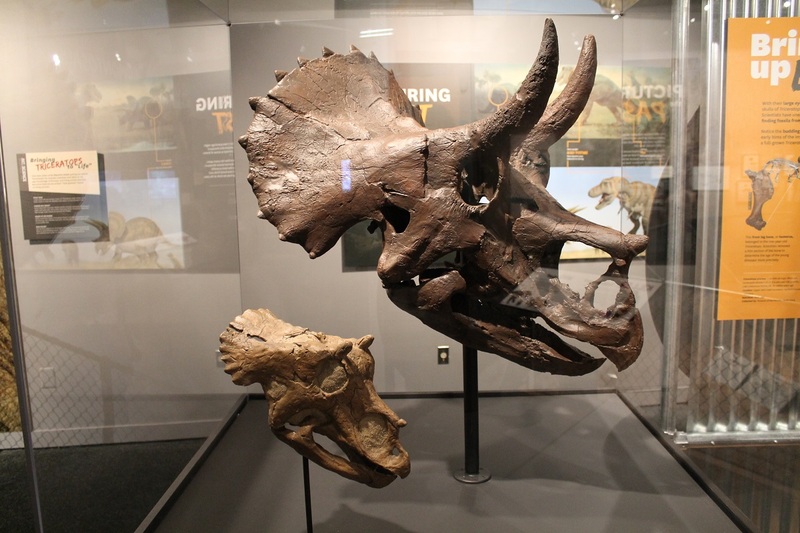 That dramatically-lit ceratopsian skull looks formidable, not at all like something shrinking back into history. Let’s talk about that ceratopsian skull for a hot sec. The other skeletons are (perhaps incredibly) reasonably accurate representations of identifiable dinosaurs. 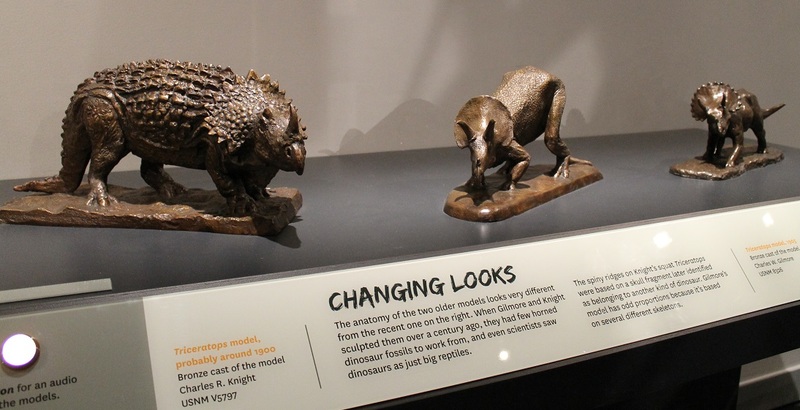 We’ve got a tyrannosaur, a hadrosaur, and a dromaeosaur on the left, and what looks like Euoplocephalus, Kosmoceratops, and Protoceratops on the right. The skull in the center stands out as the sole fanciful element in the scene. It looks like an oversized, exaggerated Triceratops, with extra-long, tapering brow horns and a frill studded with spikes. Jurassic World established fantasy dinosaurs as being part of the Jurassic Park universe, so it’s possible this represents some kind of new, fictitious hybrid. However, I was immediately reminded of Charles Knight’s classic take on Agathaumas. E.D. Cope named Agathaumas sylvestris in 1872, based on a pelvis and a number of vertebrae discovered in southwest Wyoming. It was technically the first ceratopsian dinosaur to be named and described, but without a skull, Cope had little idea of what the animal looked like (today, it’s considered a synonym of Triceratops). Charles Knight depicted imagined the animal as a sort of spiny uber-Triceratops. His striking reconstruction was copied almost exactly for the Agathaumas that appeared in 1925’s The Lost World. It would be beyond awesome if the dramatic ceratopsian skull was meant to be a throwback or nod to the mythic Agathaumas. Or perhaps I’m reading too much in to it. The Pan-American Expo Triceratops Lives On UPDATE: Or does it? Don’t you hate it when you miss something glaringly obvious? I’ve never seen the Triceratops skeleton at London’s Natural History Museum in person, but I’ve seen enough pictures to know that it’s a little weird. 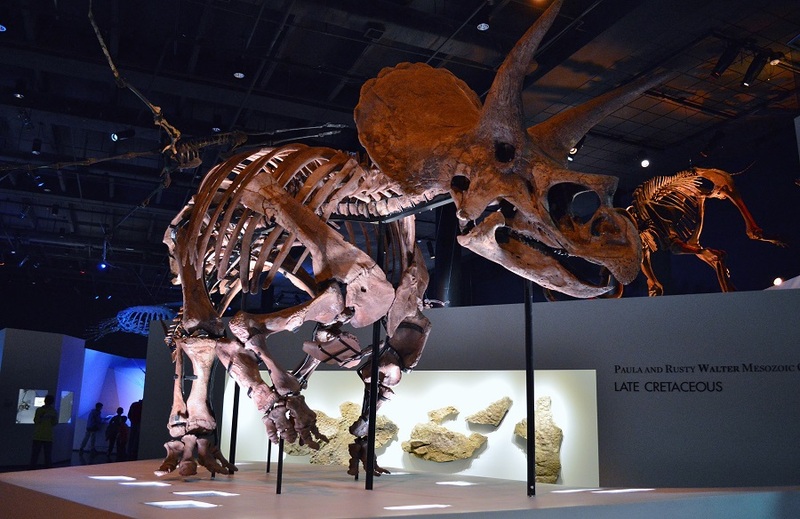 Inaccuracies like the columnar feet, dragging tail, and vertical forelimbs can be attributed the display’s age, but the head doesn’t really look like any other Triceratops skull that’s ever been found. I had assumed that the funky frill and extremely long nasal horn were sculpted flourishes, but it turns out that no part of this Triceratops is real. It’s not a heavily-reconstructed original skeleton or even a cast – it’s a papier mâché model. And not just any model, but one that I’ve already written about in a different context. Frederic Lucas, an Assistant Curator at the United States National Museum, created this Triceratops in 1900 for the Smithsonian display at the Pan-American Exhibition in Buffalo, New York. A mix of corporate and government displays based around the themes of peace, prosperity, and technology, the Pan-American Exhibition lasted from May to November 1901 (it was cut short when President William McKinley was shot on the fairgrounds). 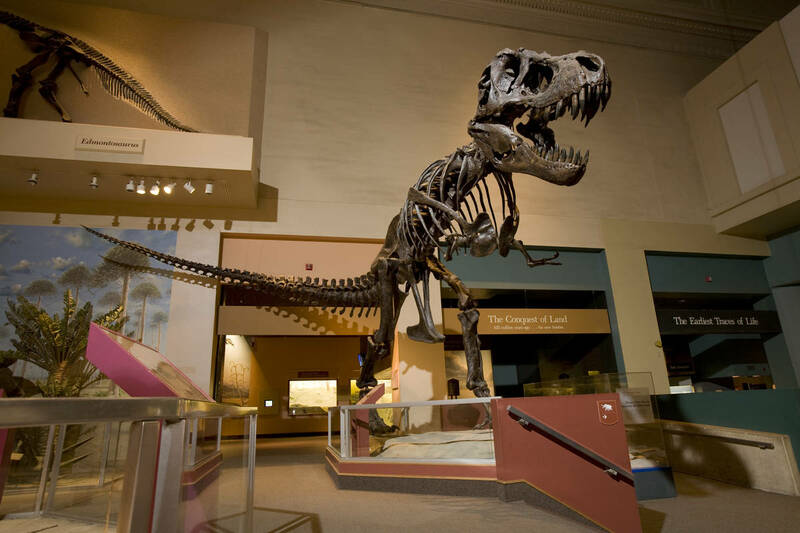 The Smithsonian’s 7,500 square foot exhibit took nearly a year to prepare, and showcased specimens from all departments of the nascent institution. Indeed, the Smithsonian’s participation in this and other fairs around the turn of the century is significant because these attractions were the basis for the some of the first exhibits at the USNM. Displays initially created for fairs often found a home in the museum’s permanent galleries, and the fair exhibitions were generally used as a template for the first generation of Smithsonian exhibits. 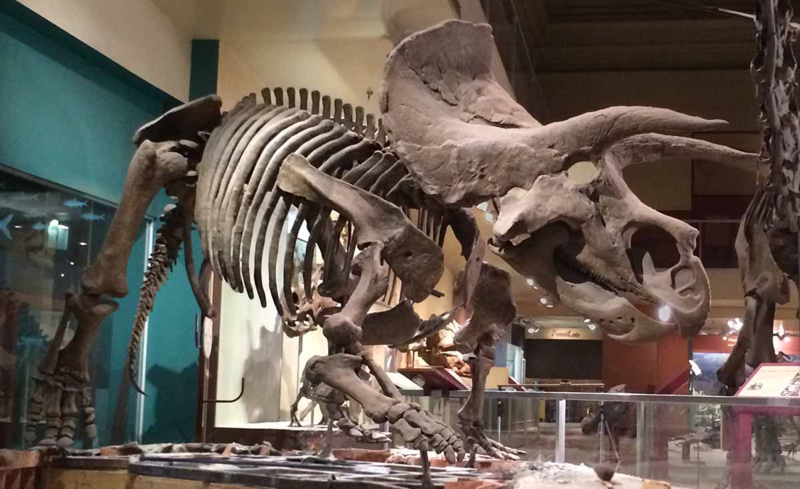 The Triceratops model was meant to represent the glut of fossils from the western United States that the Smithsonian had recently acquired from O.C. Marsh. Perhaps because most of those specimens were still unpacked and unprepared (the USNM didn’t hire a dedicated fossil preparator until 1903), Lucas sculpted the skeleton freehand based on one of Marsh’s published illustrations. It’s noteworthy that Lucas was not a paleontologist – he was brought on board at the age of 21 with no formal training because of his talent for constructing taxidermy displays. At any rate, Lucas followed Marsh’s reconstruction – at the time the only Triceratops reconstruction available – religiously when constructing his full-sized model. 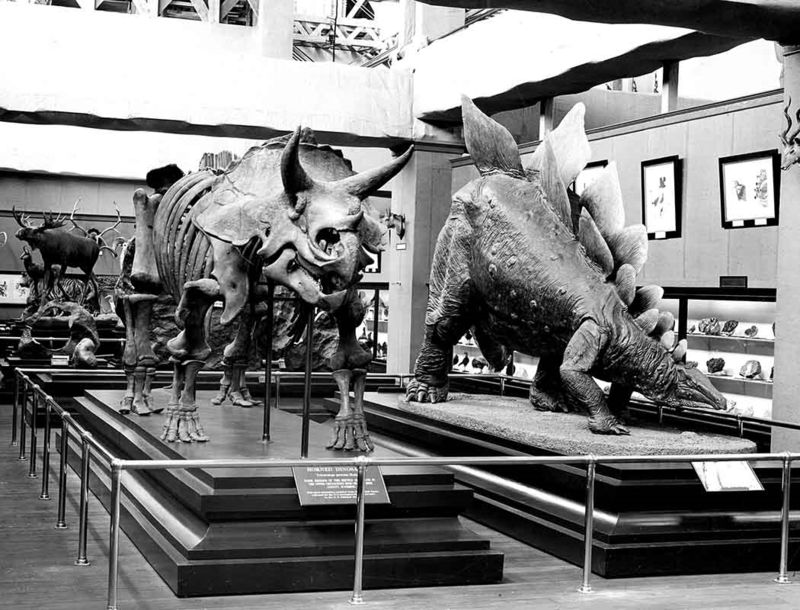 After the Pan-American Exhibition, Lucas’s Triceratops made a second appearance at the 1904 Louisiana Purchase Exposition in St. Louis, Missouri. It was rendered obsolete shortly thereafter when Charles Gilmore assembled the world’s first real Triceratops skeleton at the USNM. As I’ve covered before, the act of physically manipulating the Triceratops fossils into a standing mount showed Gilmore that Marsh’s straight-legged reconstruction was a physical impossibility. 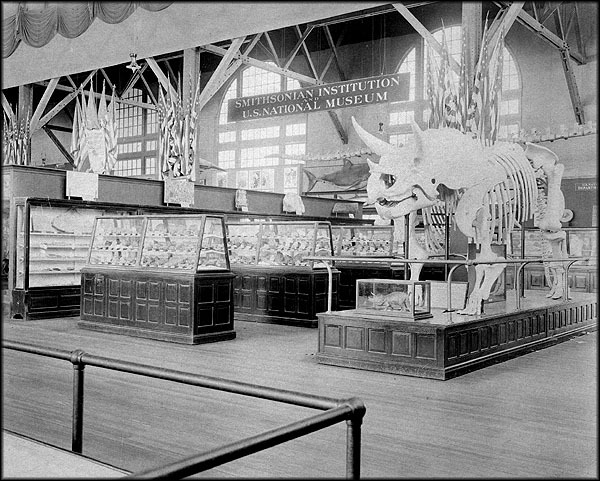 My understanding was that the Lucas model was lost or destroyed shortly after Gilmore’s real Triceratops went on display in 1905. I should have been more skeptical, however, because exhibits like this are almost never wasted. 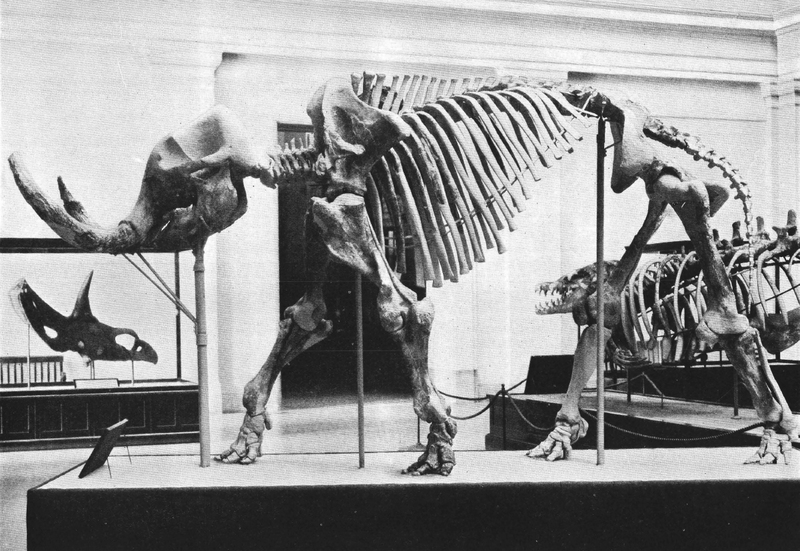 For example, Gilmore reported in 1943 that the Hadrosaurus cast displayed at the USNM before his arrival had been discarded due to wear and tear, but the mount had actually been given to the Field Museum in the 1890s. 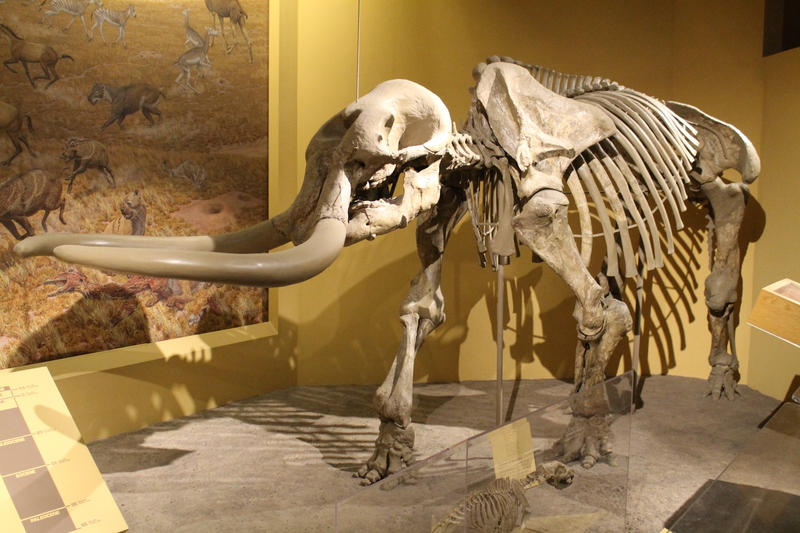 A couple months ago, I found out that Albert Koch’s chimeric mastodon (what he called “Missourium”) was purchased by Richard Owen on behalf of the British Museum and remounted. And just this year, the Smithsonian’s 112 year-old Stegosaurus model began a new life at the Museum of the Earth in Ithaca, New York. 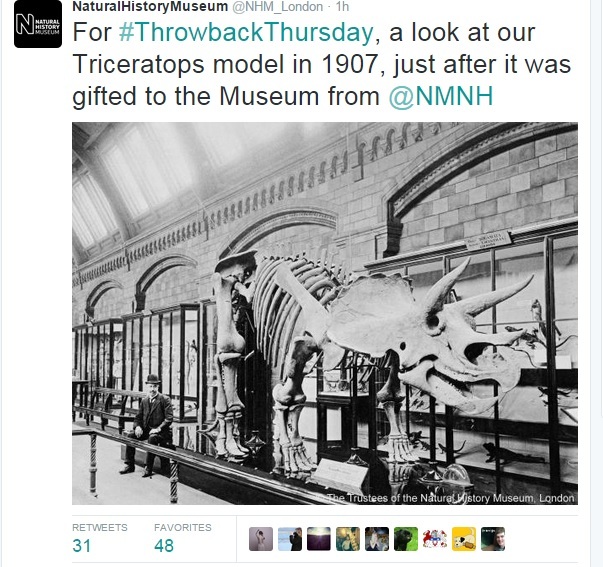 The above tweet from the London Natural History Museum finally clued me in that the Lucas Triceratops had been hiding in plain sight for more than a century. 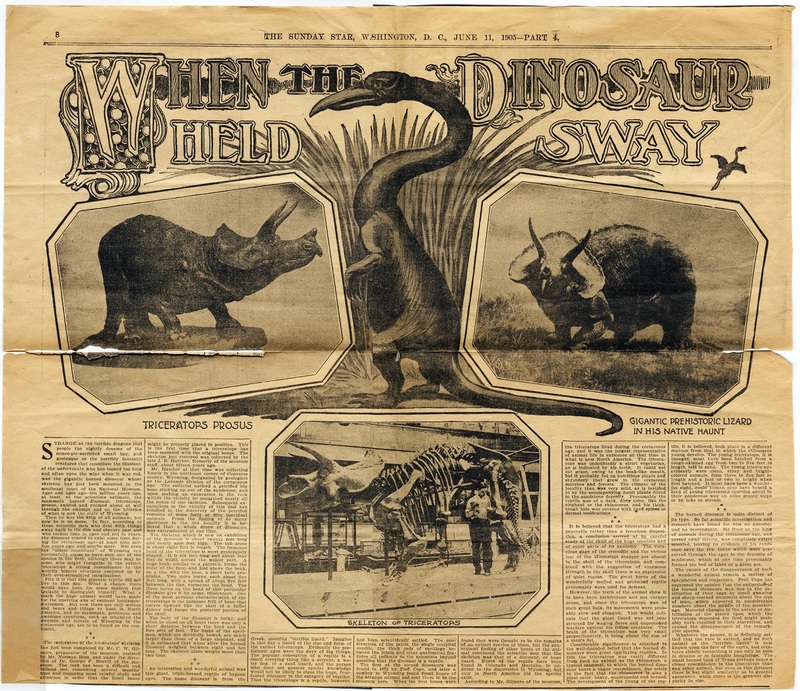 The NHM (then the British Museum) received their Triceratops from the Smithsonian in 1907 (confirmed in the July 1907 issue of The Museums Journal), just when the Smithsonian had an extra Triceratops on hand. The London model is plainly not a cast of Gilmore’s 1905 mount, but it does resemble the Lucas model in most every detail, from the way the legs are posed to the exaggerated horns and frill. The only clear difference I can see is in the position of the head, which is much more elevated in the photos from the Buffalo and St. Louis expositions. However, I imagine the model would have been partially disassembled for transport. Perhaps when it was rebuilt in London the head ended up lower, whether by accident or design. 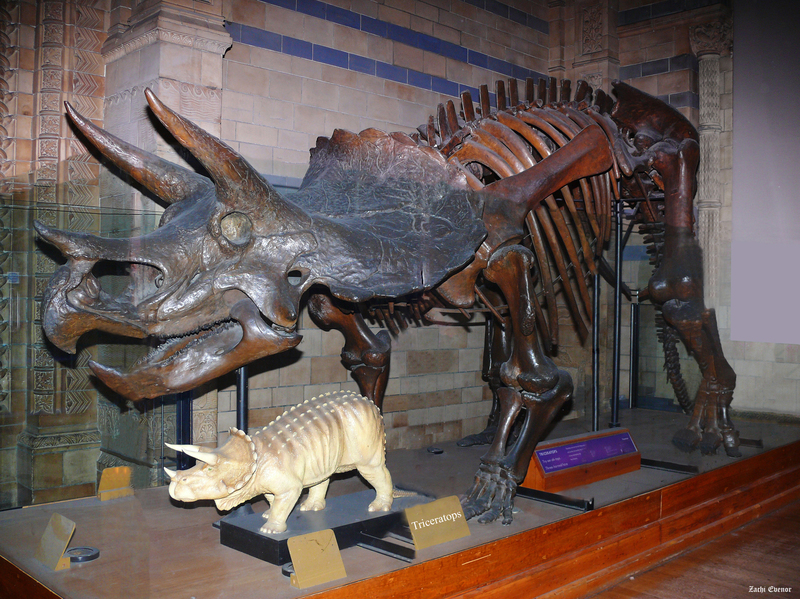 Unless there’s reason to think there were two copies of the Lucas Triceratops, I’d say the most parsimonious conclusion is that the London Triceratops is the very same model that was first displayed at the Pan-American Exhibition in 1901. Much like it’s long-time companion Dippy the Diplodocus, this Triceratops model is a century-old historic icon, one that has introduced generations upon generations of visitors to the enormity of deep time and the wonders of our prehistoric past. Inaccurate sculpture or not, it’s definitely something to preserve and to celebrate. 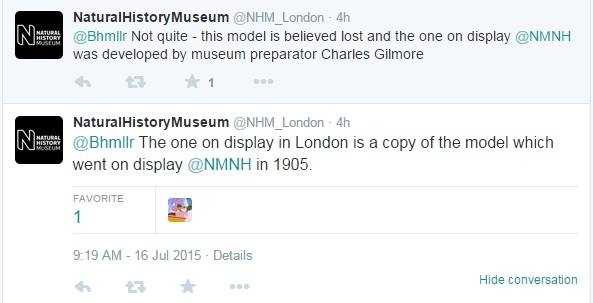 I’m dubious that the NHM Triceratops is a copy of Gilmore’s 1905 version, but hey, it *is* their museum. I’ll leave this post up for now and follow up when I find out more. I love a good museum mystery! Gilmore C.W. 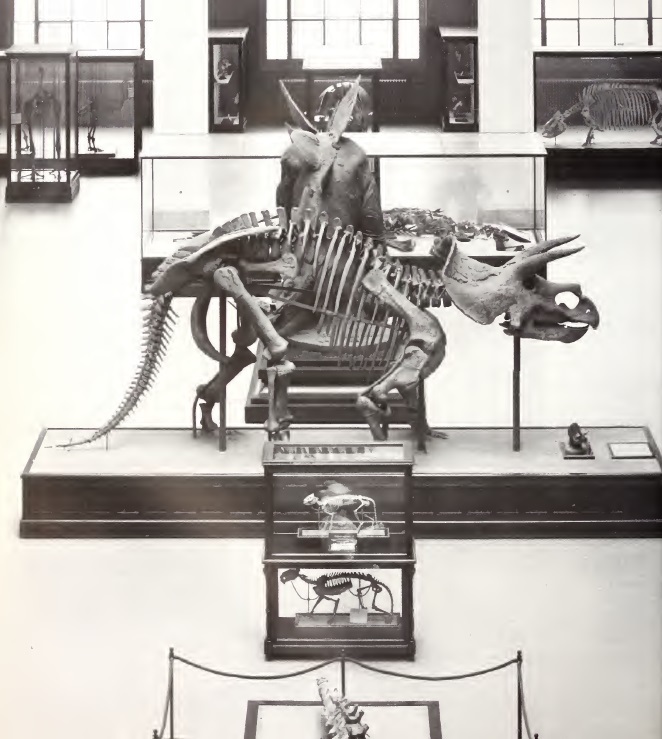 (1905).The Mounted Skeleton of Triceratops prorsus. Proceedings of the U.S. National Museum 29:1426:433-435. Gilmore, C.W. (1941). 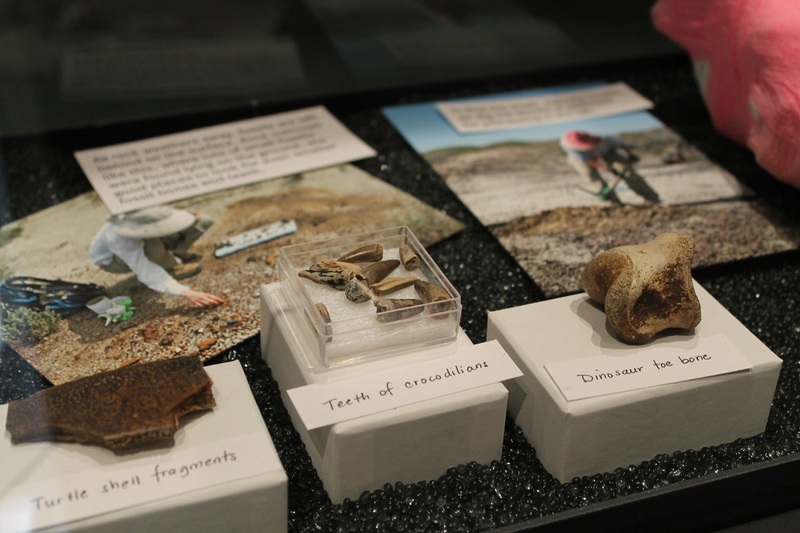 A History of the Division of Vertebrate Paleontology in the United States National Museum. Proceedings of the United States National Museum 90. Howarth, E., Rowley, F.R., Ruskin Butterfield, W., and Madeley, C. (1908). The Museums Journal, Volume 7. Museums Association. Triceratops “Hatcher” at the National Museum of Natural History. Photo by the author. 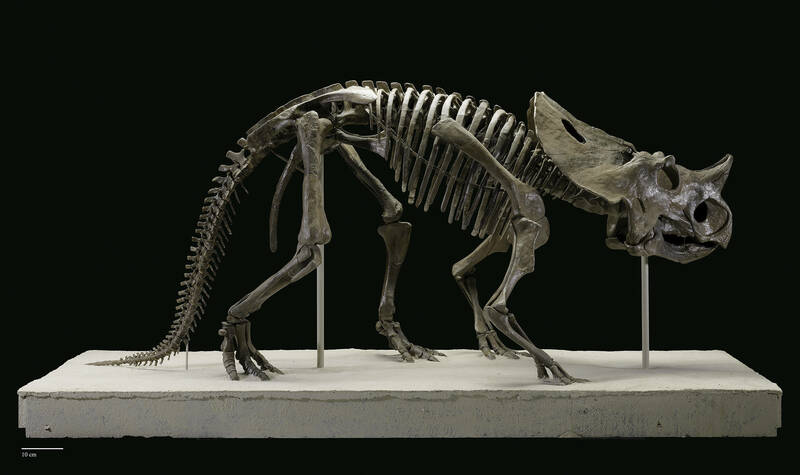 Back in July, I wrote about how the forelimb posture of ceratopsian dinosaurs like Triceratops has puzzled paleontologists for more than a century. Most quadrupedal dinosaurs held their front legs straight under their bodies, and it would make sense if Triceratops and its kin did the same. However, when researchers attempted to physically articulate skeletons for museum displays, they found that that the humerus would only fit properly with the scapula if it projected horizontally from the torso – like the sprawling limbs of a lizard. Over the years, new specimens, new research methods, and new technologies have all been used to help resolve this conundrum, but a consensus has not yet been reached. Of particular interest to me is the unusually central role mounted skeletons in museums have played in this biomechanical mystery. 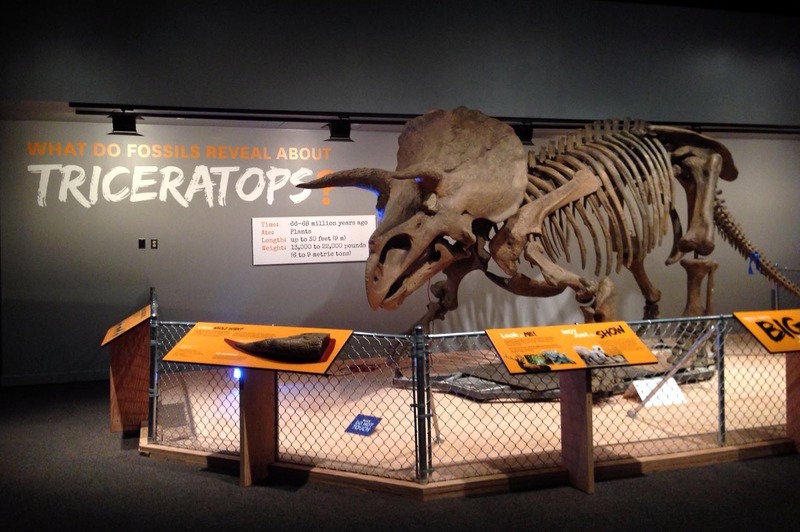 The previous post covered the historic Triceratops mounts; this entry will take a look at some more recent Triceratops displays in American museums. In 1998, a visitor looking at the Triceratops mount at the National Museum of Natural History happened to sneeze. To her alarm, the sneeze was enough to knock a small fragment of bone off the pelvis and onto the floor. 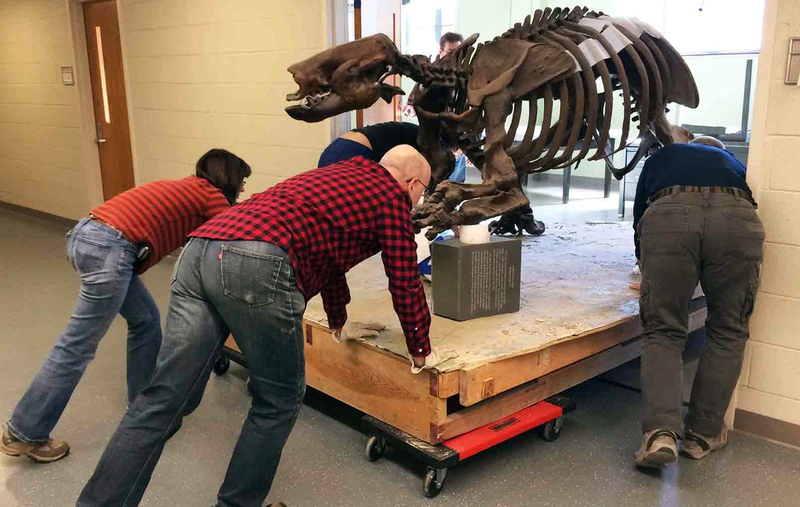 The visitor thoughtfully informed security, and after a thorough conservation assessment by Kathy Hawks, it was determined that the 93-year-old mount needed to come off exhibit, and soon. The delicate fossils had served valiantly through 23 presidential administrations, but now it was time for the skeleton to be disassembled and preserved for posterity. Retiring the classic Triceratops gave Ralph Chapman, head of the Museum’s Applied Morphometrics Laboratory, an opportunity to take on a project he had been germinating for some time. 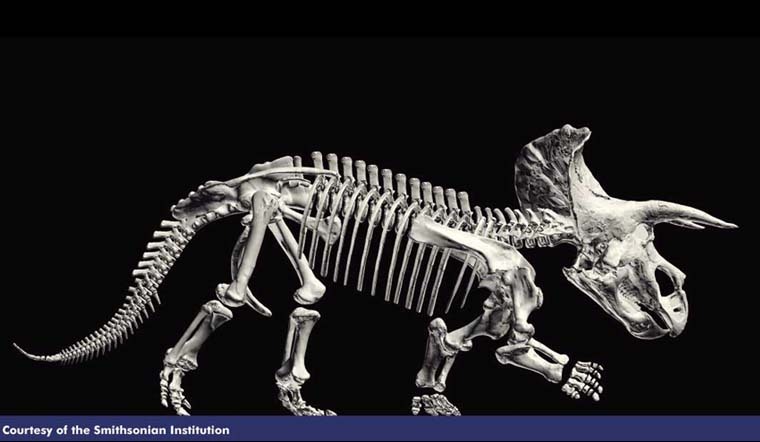 Chapman wanted to demonstrate the potential of 3-D scanning technology for paleontology research by creating a high-resolution digital duplicate of a dinosaur skeleton. Today, the process of making and studying digital copies of fossils is both widespread and remarkably straightforward, but in the late 1990s it was practically science fiction. Nevertheless, the historic Triceratops was an ideal digitization candidate for several reasons. First, the digital assets would reduce handling of the delicate and aging original fossils. Second, exact copies of the scanned bones could be made from milled foam and plastics to create a replacement exhibit mount. Finally, a digital Triceratops would be a great opportunity to revisit the ceratopsid posture problem in a new way. 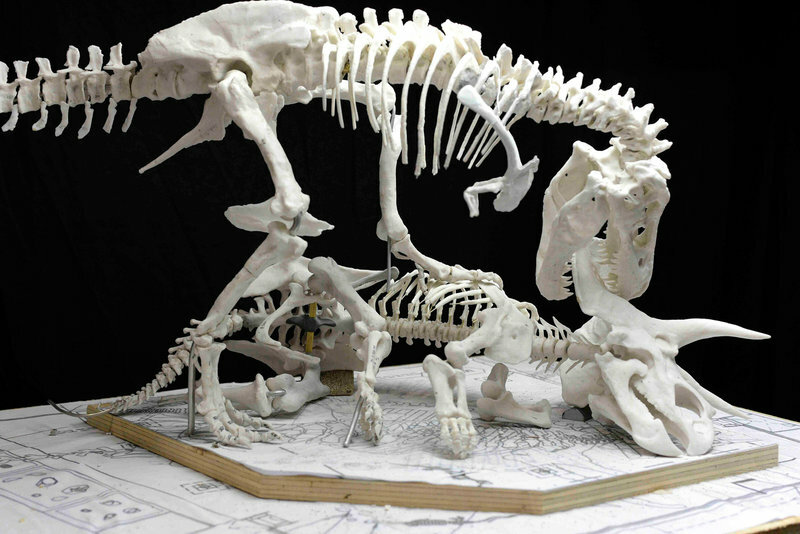 The ensuing Hatcher Project (the Triceratops was named in honor of John Bell Hatcher, who found the original fossils in the late 19th century) was a collaboration between Museum staff and several industry experts, including Lisa Federici of Scansite 3-D Services and Arthur Andersen of Virtual Surfaces, Inc. The first step was to place stickers on 100 key points on the Triceratops. These points were recorded with a surface scanner, so that the historic mount could be digitally recreated in its original pose. 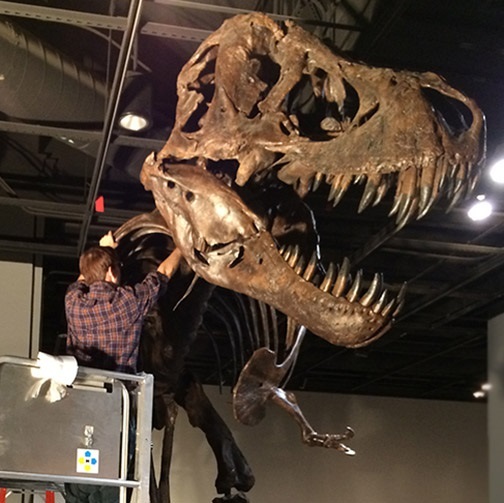 After that, fossil preparators Steve Jabo and Pete Kroehler carefully dismantled the skeleton. Each bone from the skeleton’s right side* was then scanned individually, producing 20 gigabytes of data (you’re supposed to gasp…again, this was the late 90s). 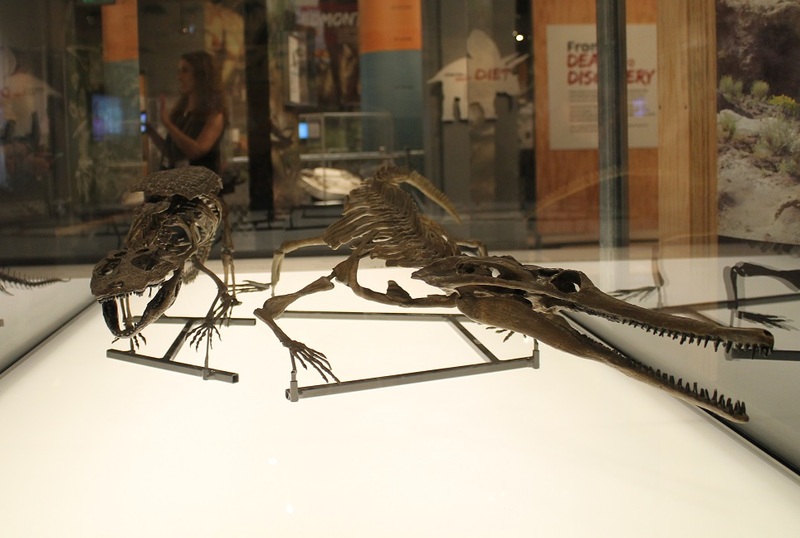 *Bones from the right side were mirrored to reproduce the left half of the skeleton. Since the original mount had been a somewhat disproportionate composite, the team made a few changes when building the new digital Hatcher. Some elements, including the undersized skull, were enlarged to match the rest of the skeleton. 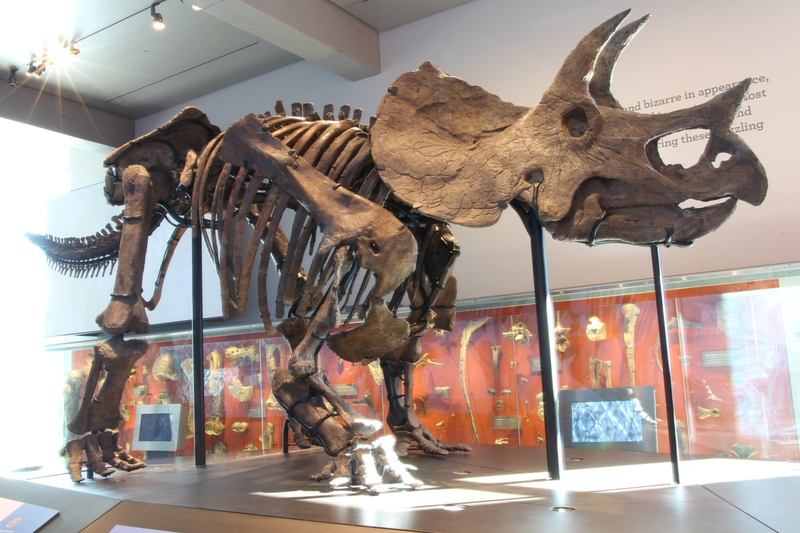 In addition, parts that had either been sculpted or were not actually Triceratops bones – such as the dorsal vertebrae and the hindfeet – were replaced with casts acquired from other museums. 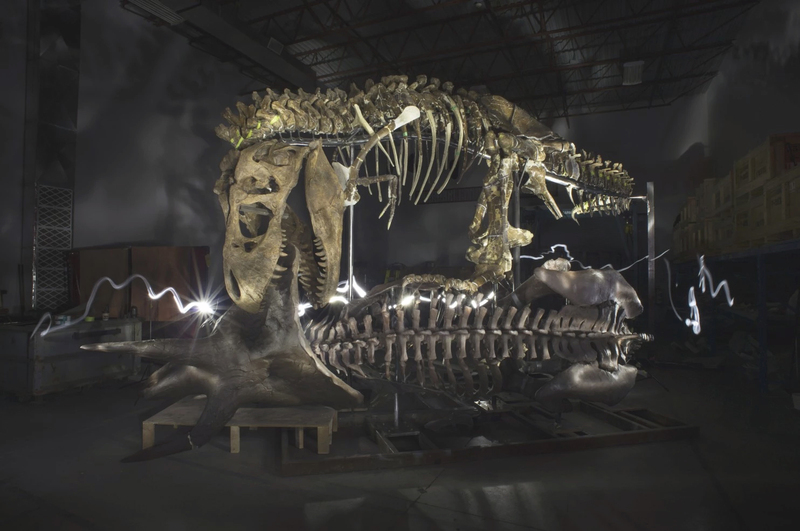 The result was the world’s first complete digital dinosaur, and shortly afterward, the first full-sized replica skeleton generated from digital assets. 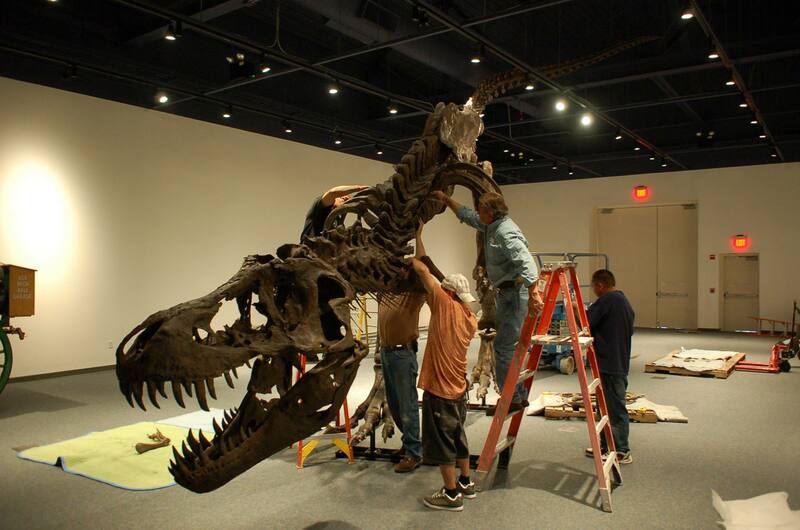 In April 2000, the Hatcher team convened at NMNH to determine how the new replica mount would be posed. Chapman, Jabo, and Kroehler were joined by Kent Stevens of the University of Oregon, Brenda Chinnery of Johns Hopkins University, and Rolf Johnson of the Milwaukee Public Museum (among others) to spend a day working with a 1/6th scale model produced by stereolithography specialist Jason Dickman. The miniature Hatcher allowed the researchers to physically test the skeleton’s range of motion without the difficulty of manipulating heavy fossils. The day was full of surprises. 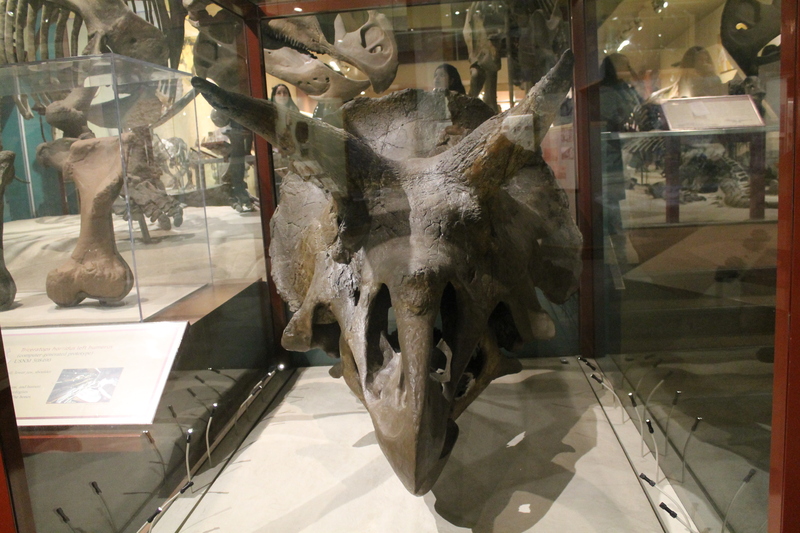 The team was impressed by the wide range of motion afforded by the ball and socket joint connecting the Triceratops skull to the atlas. They also found that the elbow joints could lock, which may have been helpful for shock absorption when the animal smashed things with its face. Nevertheless, when it came time to articulate the humerus and scapula, the team essentially validated Charles Gilmore’s original conclusion that sprawling forelimbs worked best (although the new Hatcher mount stands a little straighter than the historic version, and a lot straighter than the New York Triceratops). While other paleontologists had used indirect evidence (like evenly spaced trackways and wide nasal cavities for sucking down lots of oxygen) to support the idea that Triceratops was a straight-legged, fast-moving rhino analogue, articulating the actual bones showed once again that ceratopsid forelimbs had to sprawl. LACM Triceratops mount. Photo by Heinrich Mallison, many more here. Hatcher is the Triceratops I am best acquainted with, and I can’t help but think of it as the definitive example of this animal. However, two new Triceratops mounts demonstrate a radically different take on ceratopsid posture. 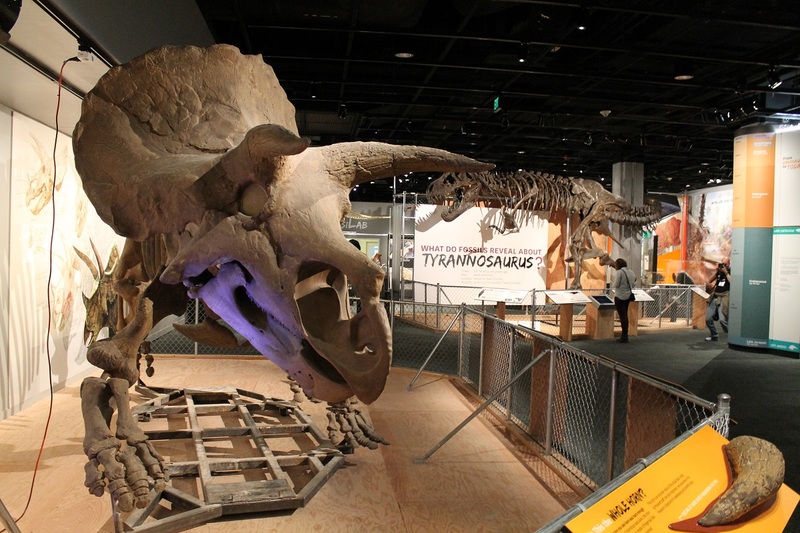 In 2011, the Natural History Museum of Los Angeles County completed a thoroughly renovated dinosaur hall, which features a brand-new Triceratops mount at its entrance. 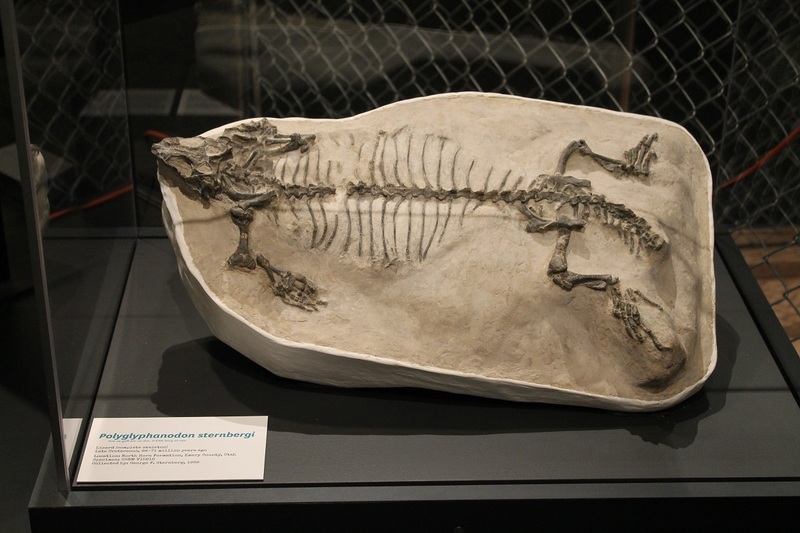 Like Hatcher, this skeleton is a composite of several specimens, in this case excavated in Montana by LACM teams between 2002 and 2004. 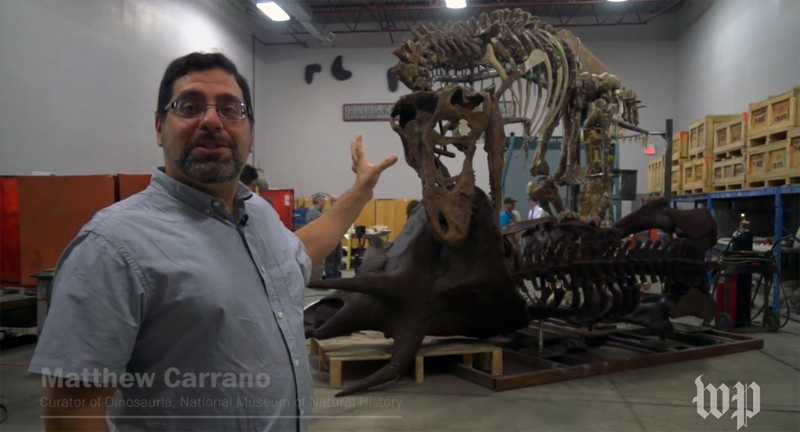 Phil Fraley Productions, the exhibit fabrication company behind Sue and the Carnegie Museum dinosaurs, was responsible for mounting the fossils. 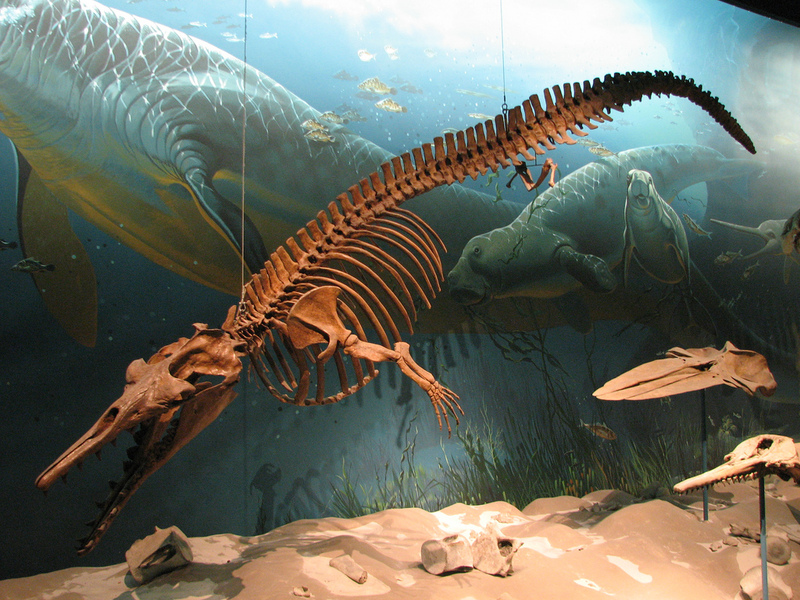 The primary specimen (LACM 141459, which provided the skull and right forelimb) is notable because it included a completely intact and articulated front leg. Although the analysis of this important find has yet to be published, exhibit curator Luis Chiappe tellingly chose an erect, rather than sprawling, forelimb posture. 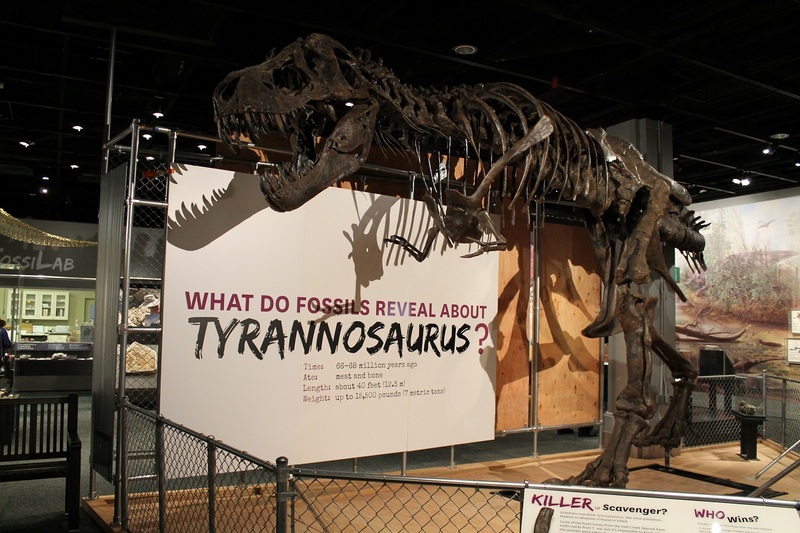 Meanwhile, the Houston Museum of Nature and Science opened its colossal, 30,000 square foot Hall of Paleontology in 2012. 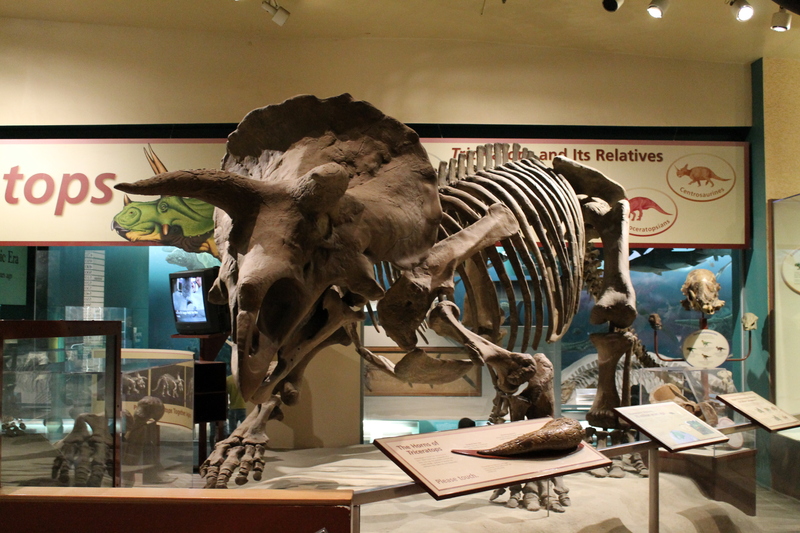 Among the dozens of mounted skeletons on display is Lane, reportedly the most complete Triceratops ever found. 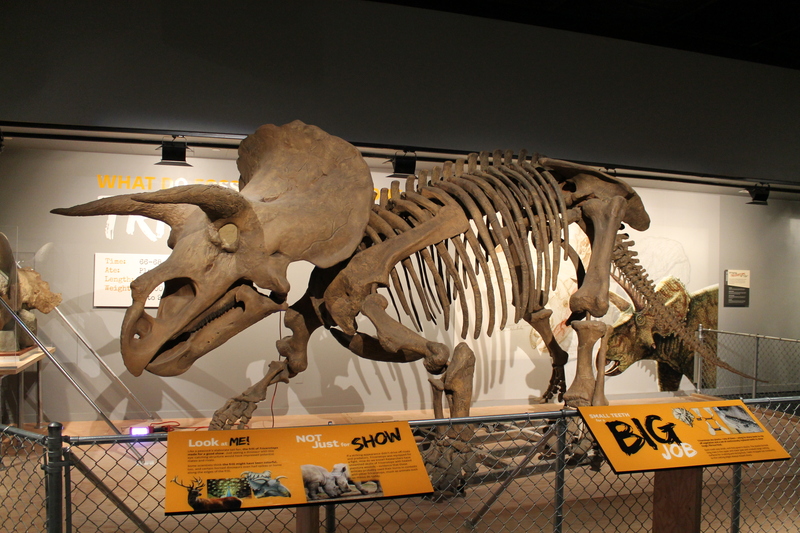 The museum purchased the skeleton from the Black Hills Institute, and the company also constructed the display mount. 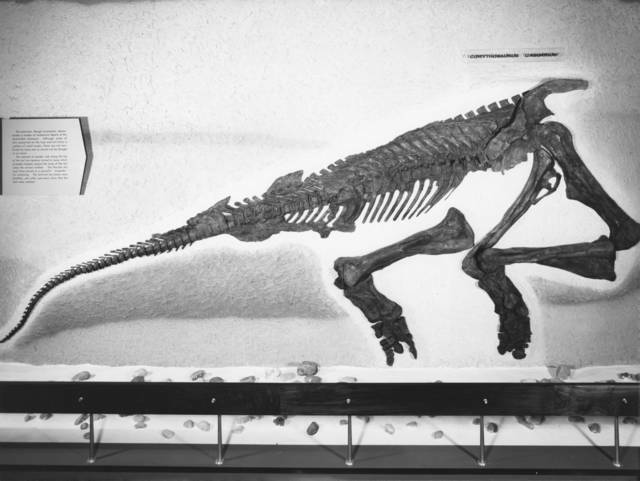 Robert Bakker, who curates the Hall of Paleontology, specifically requested that Lane be given a straight-legged, trotting pose. With two legs off the ground, this display emanates strength and speed. So how did the Los Angeles and Houston exhibit teams manage to construct plausible-looking, straight-legged Triceratops mounts? Since full descriptions of either specimen have not been published, it’s hard to say for sure. From the look of it, however, the new mounts both have narrower, flatter rib cages (as suggested by Paul and Christiansen), which allows more room for the elbow. Likewise, the shoulder girdles are lower than Hatcher’s, and they seem to have been rotated closer to the front of the chest. 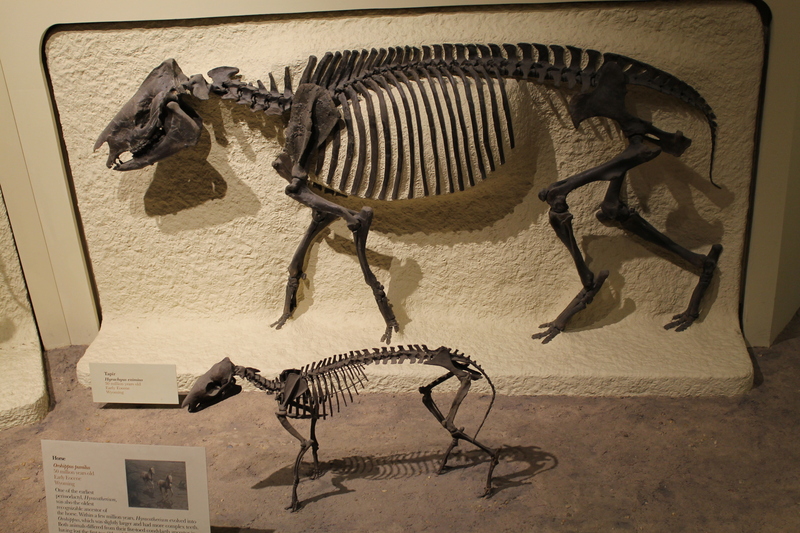 Also note that the forelimbs of the Los Angeles and Houston mounts are not completely erect – they are strongly flexed at the elbow, as is typical of many quadrupedal mammals. These new mounts don’t mean the Triceratops posture problem is resolved, though. The angle of the ribs and the position of the scapula are apparently both touchy subjects, so alternate interpretations are sure to arise in the future. After all, Triceratops forelimb posture isn’t just an esoteric bit of anatomical trivia: it has major implications for the speed and athleticism of an extremely successful keystone herbivore. 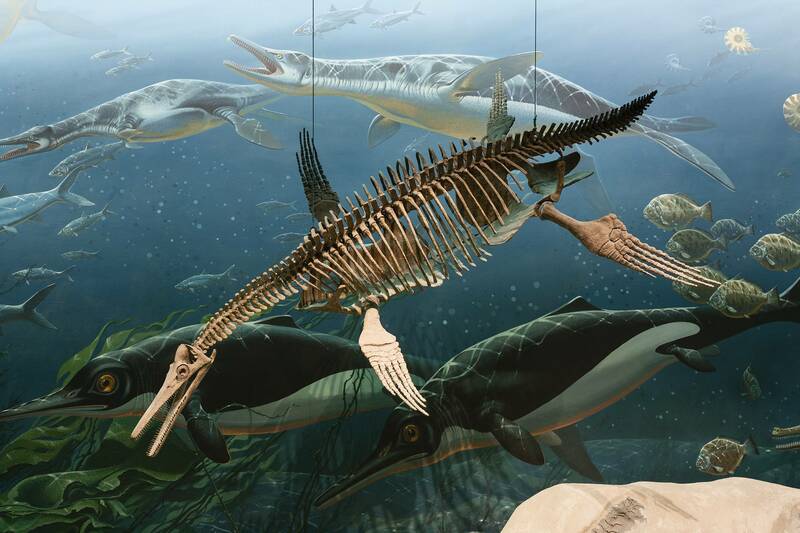 Understanding the limitations on this animal’s movement and behavior can contribute to our understanding of the ecosystem and environmental pressures in late Cretaceous North America. As such, I am eagerly awaiting the next round in this 100-plus year investigation. A big thank you to Rebecca Hunt-Foster and Ralph Chapman for sharing their time and expertise while I was writing this post! Chapman, R., Andersen, A., Breithaupt, B.H. and Matthews, N.A. 2012. Technology and the Study of Dinosaurs. The Complete Dinosaur, 2nd Edition. Bloomington, IN: Indiana University Press. Fujiwara, S. and Hutchinson, J.R. 2012. Elbow Joint Adductor Movement Arm as an Indicator of Forelimb Posture in Extinct Quadrupedal Tetrapods. Proceedings of the Royal Society 279: 2561-2570. Paul, G.S. and Christiansen, P. 2000. Forelimb Posture in Neoceratopsian Dinosaurs: Implications for Gait and Locomotion. Paleobiology 26:3:450-465.